One of my biggest concerns about the 2016 Sanders campaign was that, at least at the beginning, it was too easily forced to apologize for attacks on supposed "allies of progressives" in the Democratic ecosystem — because "unity." The prime example of that occurred when Sanders accused the Planned Parenthood Action Fund — not Planned Parenthood the health care organization, Planned Parenthood AF, the highly Clintonist political action committee, which had early-endorsed Clinton despite Sanders' excellent record on women's issues — of being "part of the establishment." 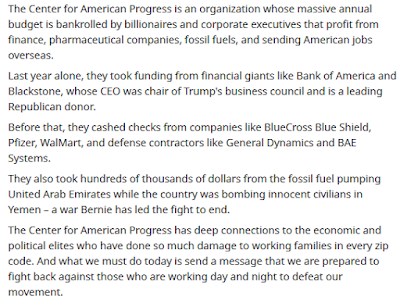 The Center for American Progress, which sponsors ThinkProgress, is led by board president Tom Daschle, who is a registered lobbyist for Comcast CVS Health-Aetna, and the Blue Cross Blue Shield Association. TP used to criticize those companies, now they carry their water. Last year alone, they took funding from financial giants like Bank of America and Blackstone, whose CEO was chair of Trump's business council and is a leading Republican donor. Before that, they cashed checks from companies like BlueCross Blue Shield, Pfizer, WalMart, and defense contractors like General Dynamics and BAE Systems. 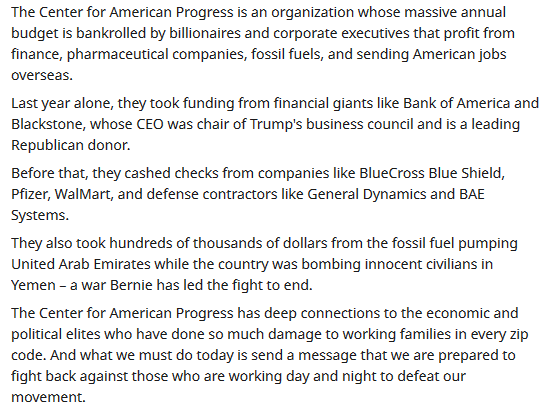 "epitome of the political establishment"
"real goal ... stop Medicare for All and our progressive agenda"
"threat to their privilege and influence"
"massive annual budget is bankrolled by billionaires"
"deep connections to the economic and political elites who have done so much damage to working families"
"working day and night to defeat our movement"
The letter also names a few of the companies and countries that bankroll CAP — Walmart, Bank of America, Blue Cross, Blackstone, the UAE. He could have listed a great many more. There are countless stories emerging from former ThinkProgress writers about CAP leadership squelching aggressive reporting because their reports were negatively affecting CAP fundraising. Read this twitter thread by former ThinkProgress reporter Zaid Jilani to see some of those. There are others as well. Bernie Sanders is not backing down this time. Unlike 2016, this will be a battle with the enemy named out loud and its deeds detailed. Looks like the fight, the one our country has been avoiding for years, is finally on.